An angel warns Joseph not to divorce Mary because the child was conceived by the Holy Spirit (1:20-21). 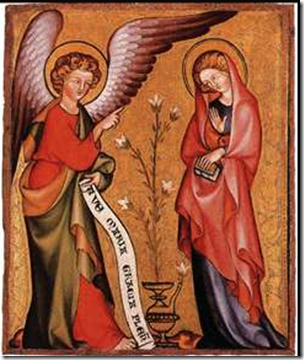 The angel indicates that the conception of the child is by the Holy Spirit. While we usually talk about this as a virgin birth, it is better to think in terms of a virgin conception and a normal birth. There is nothing in the Bible which implies that there was anything unusual about the pregnancy after it begins. Jesus’ birth was normal and Mary and Joseph go on to have other children. The Greek text does not have the definite article, the child is conceived by “a holy spirit.” There are a number of suggestions for what this might meet, at the very least it refers to the power of God as responsible for Mary’s pregnancy. There is little use trying to figure out the “science” of how this happened, then whole point is that this is a miracle from God. The child is not Joseph’s nor is he the son of any human, he is the “son of God.” The connection of the Holy Spirit to the birth of Jesus is important for several reasons. First, like Adam, the human Jesus is a special creation of God. Paul will use this parallelism between Adam and Jesus in Romans 5:12-21. The virgin birth is therefore analogous to the special creation of Adam in Genesis 2. Second, the Hebrew Bible refers to the king of Israel as a “son of God.” In Ps 2:7, for example, the enthroned King of Heaven says to the king of Israel “you are my son, today I have begotten you.” The virgin birth is the ultimate enthronement of a king in the line of David. It is significant tat Joseph is called a “son of David” in this text, the only place in the New Testament where someone other than Jesus is given that title. This likely highlights the royal importance of the child to be born. Third, there are many references to special servants of God in the Hebrew Bible who are born through miraculous circumstances. Beginning with Isaac, several old or barren women have children. Even John the Baptist is born in this classic “Old Testament”scenario. A virgin giving birth is the ultimate unlikely birth! Fourth, there are a number of references to the coming messiah / servant of God as being specially empowered by the Spirit of God, Isa 11:2, for example, describes the “root of Jesse” as having the seven-fold Spirit of God upon him. That the child is not the result of unfaithfulness, but rather a divine miracle, would comfort Joseph and assure him that this child is part of the larger plan of God. The “virgin” birth/conception fits this “made up” category quite well… NOT predicted in the OT (“alma” from Isa. is “young woman” and apparently not even a reference to a much later messiah, but fulfilled in its day), for just starters. No real evidence anyone in Jesus’ own day considered him virginally conceived, etc. You, Phillip, know of many, perhaps nearly all of the reasons this “doctrine” is so commonly seen as among those the NT writers, supported by later church leaders, added in to the historical aspects of the oral traditions about Jesus. Those reasons have real substance but even if valid they need not undermine all types of Christian faith… just the overly literalist and “biblicist” types. You are right that the VB is not really important after the first two chapters of Matthew and Luke, although it is certainly there. The trajectory from alma to parthenos in the LXX to the clear virginity of Mary in both accounts makes it impossible to read the text in any other way than a claim that Jesus was the “ultimate miracle birth” in a long line of miracles from the Hebrew Bible. Reading Matthew and Luke as connected to these stories is important since I think they intentionally wrote their gospels as continuations of the story of the Jewish people. That was more or less my point here, the VB is an interpretation/expansion on a story from the Hebrew Bible (either 2 Kings or Isaiah), when Israel was as far from God as imaginable, God was still “with them” and the sign is a woman giving birth (probably to Hezekiah). No real “miracle” there other than God still has not abandoned his people. If it was true then, how much more now when Rome rules. “Overly literalist and “biblicist” types,” other than “overly”, that is a fair description of what is going on here, reading the NT in the light of the themes of the Old. Despite my use of a combination of “styles” of “criticism” (analysis based on sources, historical comparison, anthropological patterns, etc. ), I don’t actually rule a virgin birth out as impossible (nor some kind of “resurrection” of Jesus, tho it lacks real evidence as a bodily one). The nature of my spiritual faith, and of many others I know, does not depend on any such often-presumed “core” dogmas or on the historical validation of various miracles. However, to an open and curious, close observer, there is little question that “miracles” of various types do happen. (“Miracles” which may not be over-rides of natural systems, but definitely unusual and unexplainable to this point.) Some believe they have found evidence of other “virgin births” as well… It’s just that inspiring, guiding Christian faith does not need to lean on what is much more likely part of a complex mythology built up quickly around a remarkable man and teacher – Jesus of Nazareth. All Scripture is God-breathed (‭2 Timothy‬ ‭3‬:‭16‬a NIV). If we believe the Holy Spirit inspired the NT writers, then there’s no way Jesus birth to a virgin was just “made up”. Did the Holy Spirit inspire Nathan to make up the story of the lamb?